It was cheers and hugs after Nasa's Mars lander InSight touched down safely on the surface of the planet to begin exploring the planet's core. PASADENA, CALIFORNIA (REUTERS) - Nasa's Mars lander InSight touched down safely on the surface of the Red Planet on Monday (Nov 26) to begin its two-year mission as the first spacecraft designed to explore the deep interior of another world. Engineers at the Jet Propulsion Laboratory (JPL) near Los Angeles said the successful landing was confirmed by signals relayed to Earth from one of two miniature satellites that were launched along with InSight and flying past Mars when it arrived shortly before 3pm EST (4am Singapore time). Members of the mission control team burst into applause and cheered in relief as they received data showing that the spacecraft had survived its perilous descent to the Martian surface. The landing capped a six-month journey of 548 million km from Earth, following its launch from California in May. Carrying instruments that detect planetary heat and seismic rumblings never measured anywhere else but Earth, the stationary lander streaked into the thin Martian atmosphere at 19,795 kmh. Its 123km descent was then slowed by atmospheric friction, a giant parachute and retro rockets, bringing the three-legged spacecraft to a gentle landing 6½ minutes later. InSight came to rest as planned in the middle of a vast, barren plain called the Elysium Planitia, close to the planet's equator. InSight will spend 24 months - about one Martian year - taking seismic and temperature readings to unlock mysteries about how Mars formed and, by extension, the origins of the Earth and other rocky planets of the inner solar system. The stationary probe is programmed to pause for 16 minutes for the dust to settle, literally, around its landing site, before disc-shaped solar panels are unfurled like wings to provide power to the spacecraft. 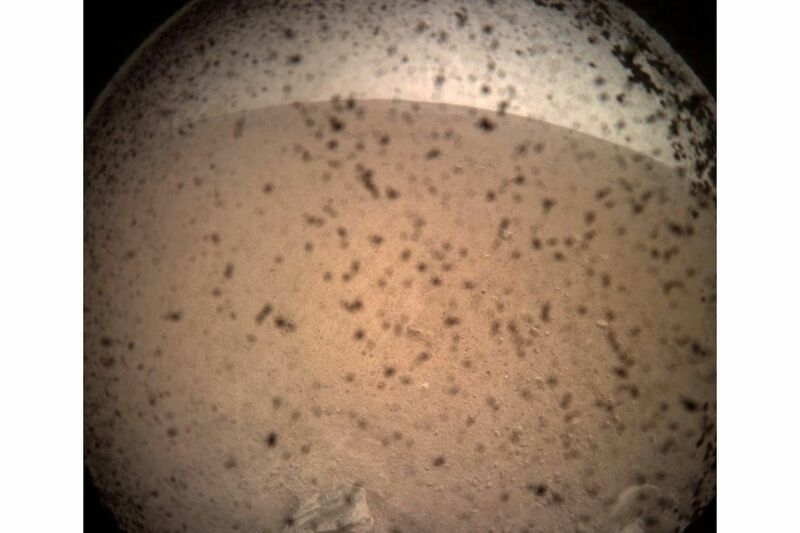 Minutes after the landing, JPL controllers received a fuzzy photograph of the probe's new surroundings on Martian soil. The 360kg InSight - its name is short for Interior Exploration Using Seismic Investigations, Geodesy and Heat Transport - marks the 21st US-launched Mars mission, dating back to the Mariner fly-bys of the 1960s.